Billionaire liberal activist and potential 2020 candidate Tom Steyer held a town hall on Tuesday where he compared voter turnout in the 2018 midterm elections to firefighters responding to the 9/11 terror attacks. 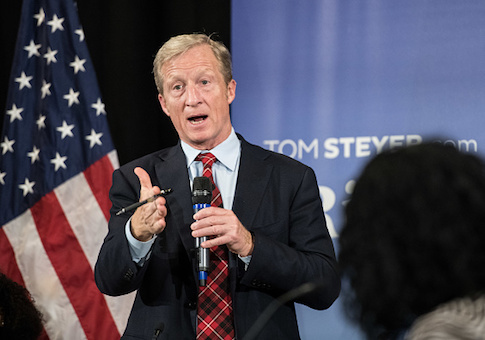 The town hall event in Charleston is another signal Steyer may throw his hat into the ring for 2020. While few Democrats have officially announced their candidacy, many are expected to do so in the coming months. Democrats considering a run include Sens. Kamala Harris (D., Calif.), Cory Booker (D., N.J.), Elizabeth Warren (D., Mass. ), and Sherrod Brown (D., Ohio) along with Reps. Beto O’Rourke (D., Texas) and Eric Swalwell (D., Calif.). The post Steyer: Voter Turnout in 2018 Midterms Was Like Firefighters Responding on 9/11 appeared first on Washington Free Beacon.